To mark the 40th anniversary of the foundation of Circles – Women’s Film and Video Distribution, we are delighted to present two works from the LUX collection that were included in the first Circles distribution catalogue: Shadow of a Journey by Tina Keane and Focii by Jeanette Iljon. Shadow of a Journey was filmed on a ferry traveling between the Isle of Harris and the Isle of Skye. On screen light and shadow play across re-worked images of the sea, reflections of passengers and birds broken apart and reconstituted by the moving waves. As the images play Peggy Morrison narrates the story of the Highland Clearances in Harris, her poetic, lilting voice juxtaposes with the harshness of a story remembered across generations of women. In Focii, a woman dances and mimes, her stark white image moves a red floor, reflected in a fractured wall of mirrors. 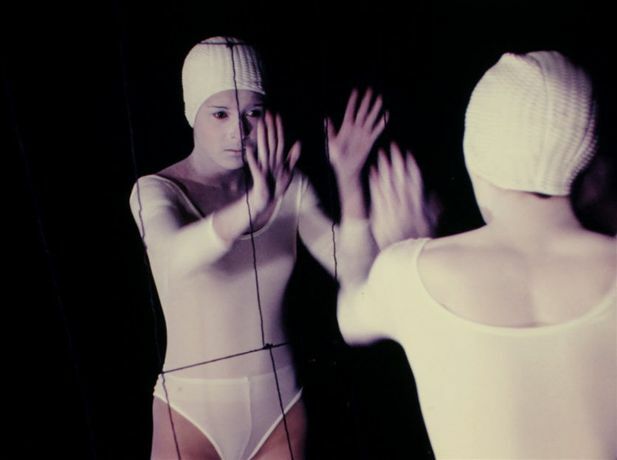 As she performs, her mirror image gradually assumes an autonomous identity transforming what was a central relationship of self to self to that of self and other. Focii not only explores the construction of self, and the dynamics of self and other, but also the interaction between the viewer’s body and the body on screen, raising questions on the nature of identification in cinema. Founded in 1979 by a small group of filmmakers including Felicity Sparrow, Lis Rhodes and Annabel Nicolson, Circles was the first women artists’ film and video distribution organisation in Britain. It operated initially from Felicity Sparrow’s flat in Highgate . Circles’ programme included women only screenings and group discussions that took place at Four Corners Film Workshops in Bethnal Green. In 1991, Circles merged with Cinema of Women to form Cinenova.